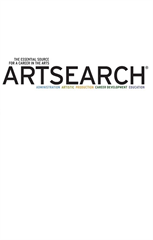 Unlimited access to ARTSEARCH®, the essential source for a career in the arts with over 3,000 jobs posted annually. Whether you're looking for full-time or part-time, seasonal or year round, paid or volunteer, ARTSEARCH® makes your job search easy. Please note: Your ARTSEARCH access will take 10-15 minutes to activate after checkout.